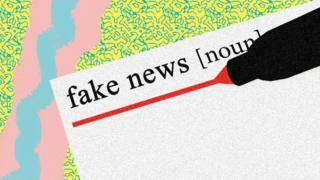 A year on from his election victory, President Trump's frequently used phrase "fake news" is now common currency. It was even named word of the year by the dictionary publisher Collins. But being aware of fake news does not mean we can always spot it. "Everything gets flattened out on social media," says Dr Philip Seargeant, who lectures in applied linguistics at the Open University. "There are jokes one minute, serious issues the next, and you are getting them from friends. So, it's more emotional, more partisan." Dr Seargeant says universities are ideally placed to help students and the wider public decide what stories to believe. Universities work hard to build students' critical skills for academic work, but these skills have more relevance than "just checking your references or checking the authority of the information you have when you are writing an essay, exactly the same thing applies to how the news works", he says. In January, to coincide with the anniversary of Mr Trump's inauguration, the OU will publish a series of YouTube videos, designed to help the general public make more informed decisions about news. First up, says Dr Seargeant, it's absolutely crucial to check the source of the story and decide whether it's reputable. This can mean making sure you know exactly which website you are looking at. So, check the URL. And be sceptical if the story comes from a news organisation you have never heard of, says Dr Bell. 2 - Is it just on one website? Next, check whether it's reported elsewhere or just by one website.Google the claims in the story to check if they have been highlighted as fake or just don't exist elsewhere. Fact-checking sites such as Snopes or factcheck.org can help. "If everything's coming from the same source, that's likely to be highly dubious," says Dr Seargeant. "But if you've got two or three media organisations reporting the story, that would be more convincing." 3 - What's the agenda? "All media has a perspective, lots of that shades into a bias, but usually these specifically fake news sites have a particular agenda," says Dr Seargeant. Considering the motivations of the author can help you make up your mind. You should also consider who shared it to your timeline and why, he says. Some fake news is produced for comic effect. So, read it properly and be sure it's not a leg-pull. Daft bylines, along the lines of April Fools stories, can give the game away. Some people believe the "mainstream media is entirely biased", Dr Seargeant says. "So, anything that puts itself in opposition to that, that's their way of finding some sort of authority. "If mainstream media isn't reporting it, the likelihood is that it's out on a limb somewhere." Make sure you know whose figures are being reported. "You can probably trust it if the number is taken from a national or international statistical office report, or a survey conducted by a renowned research company or a scientific institution," says Dr Bell "You should be more sceptical if you have never heard about the source or know that it has a particular agenda." Check the sample size. Surveys need to be big enough to be sure that the result didn't just happen by chance. Usually, this should be at least 1,000 respondents, to allow for a margin of error of up to three percentage points, says Dr Bell The smaller the sample, the more likelihood the result is a "random aberration", he says. A large sample does not always mean the result is correct. If the people surveyed are not representative of the population we're interested in, the results will not be accurate, says Dr Bell. For example, in 1936 a poll of 2.4 million people for a magazine got the US general election result completely wrong. This was because the survey was sent to magazine subscribers, who were generally wealthier than most Americans. "Whilst polling companies do their best to correct this (and still often get it wrong), other newspaper or Twitter surveys might not," says Dr Bell. 9 - Is it what it says on the tin? Check the thing being measured is what the news article says it is. For example, in 2015 a Sun headline claimed one in five British Muslims sympathised with jihadis. But last year the Independent Press Standards Organisation ruled the headline was "significantly misleading" as it had been based on a poll that had not mentioned jihad at all. "Just because a number looks dramatic, doesn't mean it is," says Dr Bell. "For example, the Bank of England recently increased interest rates, for the first time in 10 years - but rates were only increased to what they had been until August of last year, where they'd stayed since March of 2009. "That rate, of 0.5%, was the lowest in the bank's history, dating back to the 17th Century." » What is 2017's word of the year?